The Brutocao family was originally from Italy, and after immigrating to California, married into the Bliss family of farmers. Irv Bliss bought his Anderson Valley property in the mid- 1940s, and the family began making wine in 1991. The label features the Italian Lion of St. Mark, a symbol of family tradition and quality. Brutocao Cellars produces over twenty estate wines with an emphasis on Zinfandel and Italian blends from its 450 acres of vineyards in the southern areas of Mendocino County. The Brutocao “Wine Center” in Hopland is a 7.5-acre wine and food complex at the site of an original school building dating to the 1920s. The Brutocao Schoolhouse Plaza includes a restaurant, tasting room, wedding pavilion, lawn concert area, banquet facilities and gift shop. A second tasting room on Highway 128 in Philo is inside a charming wood barn venue with a covered outdoor patio. 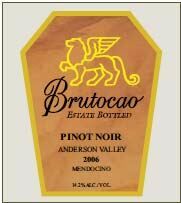 The Pinot Noirs are crafted from Brutocao vineyards in Anderson Valley by winemaker Fred Nickel. The wines are available in the winery’s two tasting rooms and online.